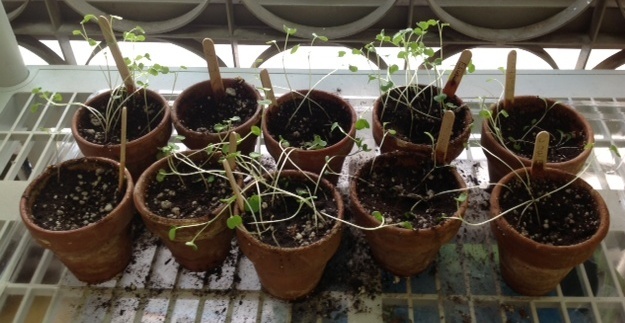 In Ms. Adams’ 3rd class class, there is no longer a mystery about what difference a grow light can make. Since last week, Ms. Adams says they have been practicing their new vocabulary word a lot. And then I heard it, too: “Those plants on the bottom are leggy,” they reported, the last word saturated with sass. In our experiment, the plants on the bottom rack have relied on only filtered sunlight, while the privileged ones on top have flourished under their grow light. Over the last few weeks, Ms. Adams says she’s referred back to the project several times as she continues to teach the scientific process. They’re realizing that every time they run over to check out their plants, first thing in the morning, before lunch, etc. they’re doing one of the important steps “observations.” She pushed them a bit further. “And if we wrote down what we noticed, what would that be?” Data. Now that we’ve wrapped up this experiment, they’re eager for more, asking questions– bringing us back to the beginning again. Watch out! These young scientists are at work.